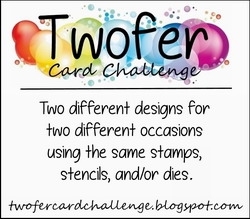 Please follow the rules below and the prompt above and then add your cards to the gallery. Make sure to take one picture with both cards to share on the link to the gallery. My second card is for Christmas. I stenciled stars in the background with iridescent glitter paste ... you can just see a small glimpse in the photo, but it's so much prettier in real life. I cut the image and background (made with my new Lindy magical sprays) using a partial circle die ... almost looks like the top of a snow globe. I added more stenciling on the blue background - falling snow done with snowflake paste which had a little glitter included. We have Susan (Cardmaker's Garret) joining us this month are our Guest Designer. Welcome Susan! 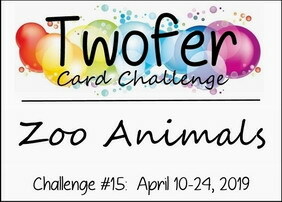 Please check out the challenge blog to see the amazing Zoo Animal cards from our Designers and special Guest Designer, Susan. Then come join us! Ink: Black (Memento); Distress Inks: Gathered Twigs, Candied Apple, Twisted Citron, Broken China (Tim Holtz). Both cards are adorable. What a sweet image. I really like the pattern paper on the red card and the colors on each. Thanks for sharing, Loll! Just look at the sweetness, sigh... You've made a pair of pretty cards with this pair of darling critters, Loll. On the first card they appear love struck, sitting in their snowy landscape with the beautiful swirly red sky behind them. On the second card they look somewhat surprised to find themselves nose to nose with their scarves entangled. Both adorable, clean, and lovely! What a pretty pair of cards, Loll The swirly patterned paper makes a terrific background but my eye is really drawn to the blues and shimmer in the second version. Beautiful and I think your second card looks like a snow globe too!! These are darling cards to highlight this sweet set. Absolutely adorable cars!! Love 'em. Two too cute images here Loll. Love the backgrounds on both and what a difference you have made here for the Twofer Challenge. Adorable cards, Loll! I love your backgrounds and how you outlined the scarf with your silver pen...great way to make it pop! Love your snowglobe shaped panel on your Christmas card, too...so cute! Adorable image and impeccable coloring, Loll! I love how you used this stamp for two very different occasions. These also look so fun to do and both backgrounds work so well with the image. Your polar bears are adorable, Loll! The silver along the edges of the scarves did the trick! A sweet love you card! Love the Christmas card with the snowy background and their pretty green scarves! It does look like a snow globe! Those are the most adorable little bears! And they work perfectly for both Christmas and Valentine's Day. Love the starry snowy background for the Christmas one. And beautiful dp for the other one. Adorable cards Loll, love the play with the bgs.. I hope I have time to play along. Oh so cute, Loll. The second one does look like a snow globe. Those polar bears are so sweet with their little noses together and their scarves entwined in a heart! Your details are spectacular! I love how you enhanced the scarf with the silver border, and the sparkle is evident on your wintery snow globe card (looks like my yard right now). When I was little, we lived near the Brookfield Zoo near Chicago. I loved our massive polar bears! These are both so sweet in both colors! Love those adorable little bears! Both cards are so sweet Loll! The image you used is just ADORABLE, and I love the bears in the LOVE card with the patterned paper background (and great way to make the scarf stand out!). Your Christmas card is just as sweet and I'm loving your snowy background with the sparkly paste snowflakes...in fact I like your snowflakes much better than the ones that were covering the ground when I woke up this morning!! Yuck! I thought it was Spring! But anyway, two absolutely cute, CUTE cards!! both such adorable card...love them and the colours you used are great. Darling bear duo, Loll - I can see why you'd choose it! Just love both cards but especially the love one - great paper behind your bears and, you're right, the silver outline to the scarf added the perfect touch!! Loll, I let myself be seduced by the impression that the heads of teddy bears are placed on the distance foam. Such perfect use of shadows in your image! You have used this stamp so creatively to make your cards. A great fun entrance to Darnell. Sweet cards! Love the bear image, the scarf and the sweet little kiss they're sharing! Great use two ways!